Thanksgiving vacations are as varied as the dishes served up on the great American holiday. From traditional feasts in the Northeast to baking bodies in the tropics, the world is your oyster when it comes to finding tantalizing ideas for a vacation during the week of Thanksgiving. 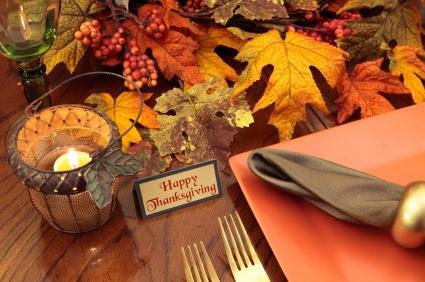 Thanksgiving is traditionally spent with family dining on turkey, stuffing and pumpkin pie. But, who says you need to gorge on a big bird at grandma's house year after year. Instead of squeezing into your relative's overstuffed house, why not take advantage of the four-day Thanksgiving holiday and set off on a real vacation? Aruba: Head home from the long holiday weekend with a tan by hitting the beaches of Aruba. Fall is an off season for this seaside destination and that means low airfare and great deals on vacation rentals. Chicago: This Midwest metropolis offers all the Thanksgiving festivities that New York City does, including massive parades, incredible hotels and fabulous shopping, but at a substantially lower cost. Plymouth, Massachusetts: If you are looking for the quintessential American Thanksgiving destination, then head to Plymouth, Massachusetts. Take a trip back in time by boarding a life-size replica of the Mayflower. Then, eat, sleep, and pretend you are a Pilgrim at the Plimoth Plantation. Denver, Colorado: Ski off your second and third helpings of turkey by hitting the slopes around Denver, Colorado. Many of the state's best resorts, including Aspen, Vail and Breckenridge open in November. Orlando, Florida: Where else can you dine on a bird sitting next to a mouse? Thanksgiving is a major production at Disney World and other popular Florida theme parks. Enjoy extended hours, holiday parades, and special turkey-themed meals. Thanksgiving is traditionally the busiest travel time of the year, and often the most expensive. With millions of people trying to get home for the holiday you can expect high prices for plane, train and automobile travel. However, savvy travelers know that you don't have to go bankrupt paying for a Thanksgiving vacation to remember. Early birds save: For unbeatable Thanksgiving travel deals, book airline tickets, rental cars and hotel rooms as soon as possible. The earlier you iron out the details of your vacation, the more money you will save. Planning in advance is key. Timing is everything: Plan your Thanksgiving travel for off-peak days. The priciest and most chaotic days to fly in November are the Wednesday before Thanksgiving and the Sunday after. To avoid paying outrageous airfares, schedule your flight a day or two before or after the peak days, or on Thanksgiving Day itself. The long Thanksgiving weekend creates a great opportunity to get away. However, you don't have to go far in order to create a Thanksgiving vacation to remember. European and Caribbean destinations are hugely popular during November, but you can have just as much fun by escaping to Thanksgiving vacation destinations within easy driving distance of major metropolitan areas, including Atlanta, Dallas and Washington, D.C. Just remember to pack your patience because no matter where you go during the Thanksgiving weekend you are bound to have plenty of company.